If you think I do too many reviews of the fifth generation Mustang, you may be right. So far, I have done a 2012 Mustang V6, 2014 Mustang 5.0 GT, and a 2005 Mustang V6 (all manual transmission coupes of course.) 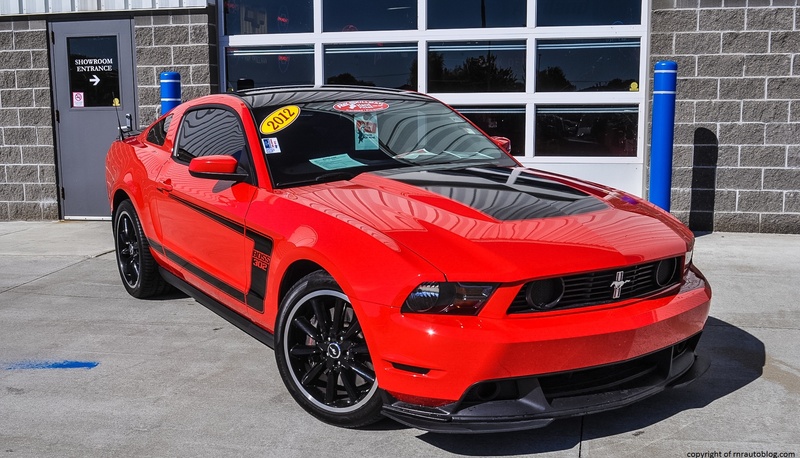 Well, now I have an additional manual coupe to add to the list: the 2013 Mustang Boss 302. 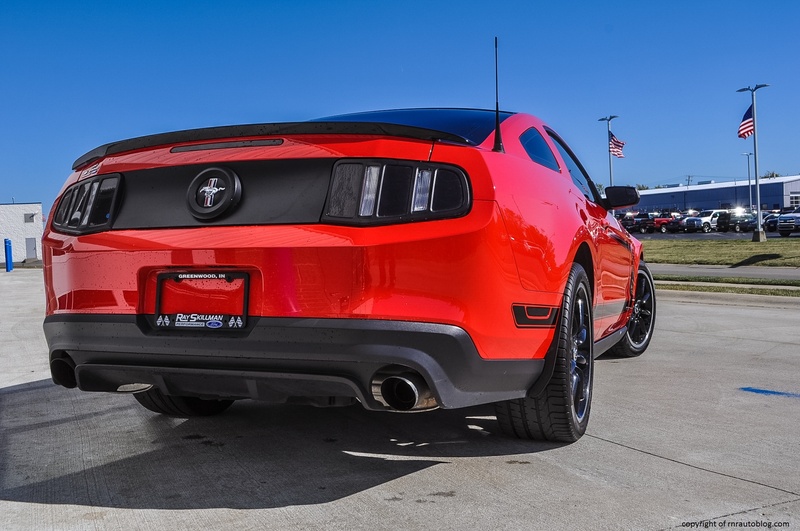 The history with the Mustang harks back to the 1960s, or more specifically 1964 when Lee Iocacca came up with the idea for a sporty and practical vehicle for the masses. Equipped in many body styles as well as numerous powertrain configurations to suit the American tastes, Mustang sales skyrocketed. 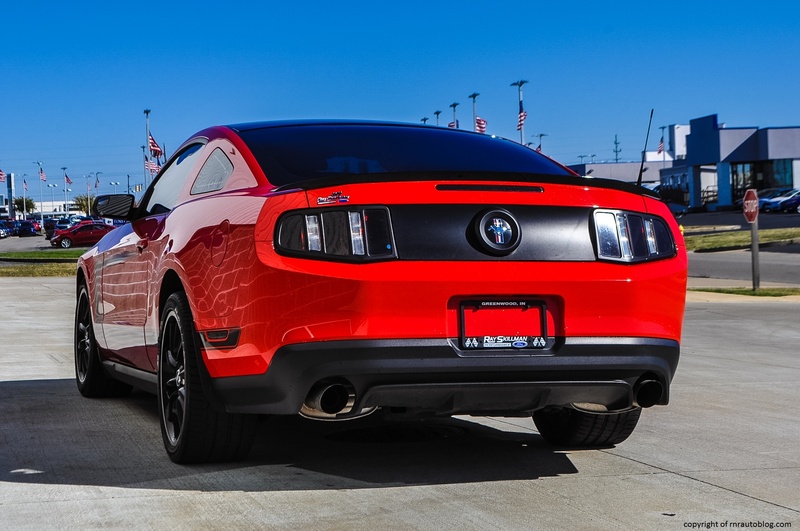 In just 18 months after it debuted, the Mustang sold over a million units. For six generations, the Mustang has successfully cultivated its heritage while morphing into a household name. 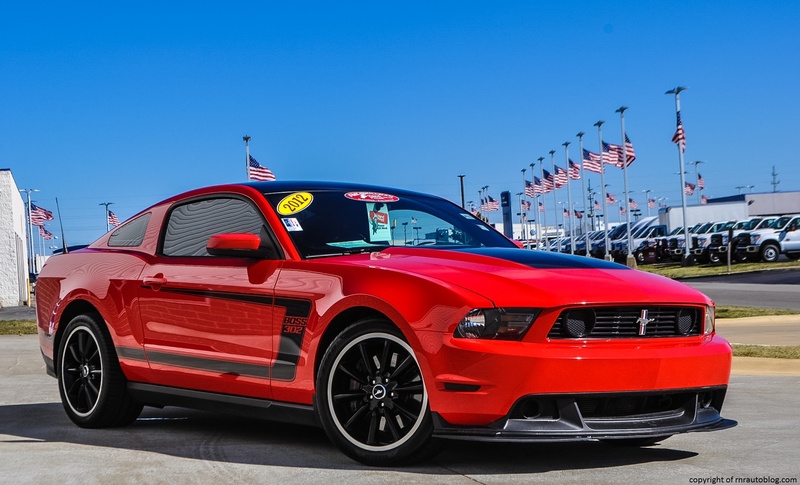 The Mustang also introduced several notable special editions such as the Shelby Mustangs, Bullitt, and the Boss 302. Due to the success of the first Mustang, Chevrolet scrambled to develop a worthy adversary which would become the Camaro. Boasting small and big box V8 engines, the Camaro proved its advantages over the Mustang which featured smaller engines. 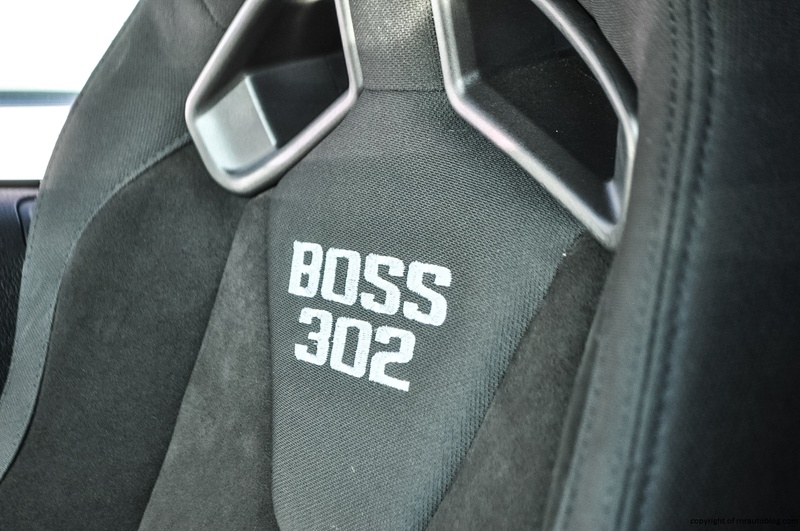 The original Boss 302 was Ford’s answer to the Camaro. The 302 name is derived from its 302 cubic inch engine. 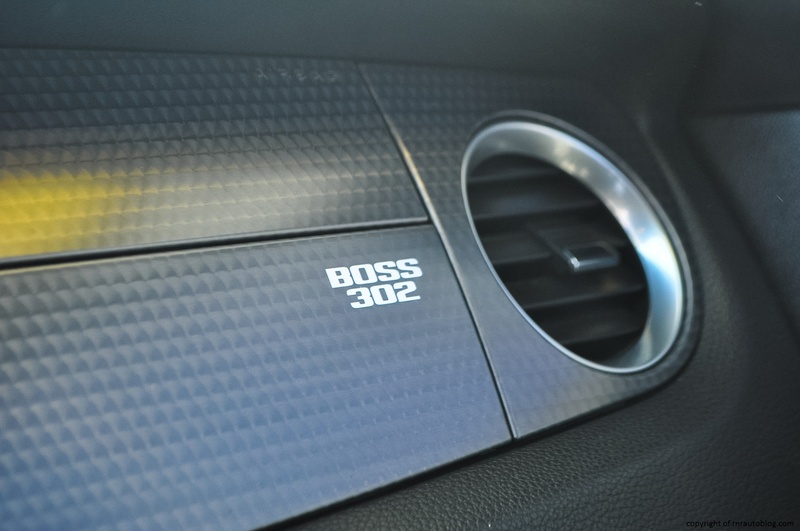 This car was developed in secret, so if anybody asked what car this was, the employees in charge of this car always referred to it as the “Boss’ car”, hence the Boss designation. It was also developed for a racing homologation series, hence the mechanical modifications. 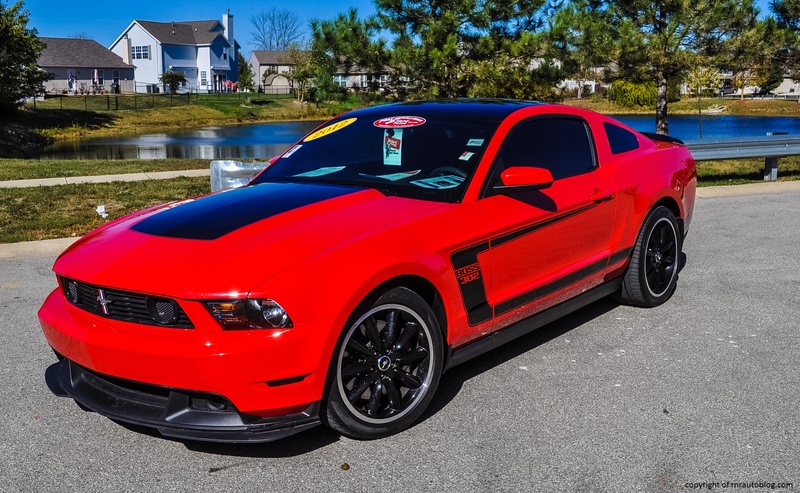 The first Boss 302 was sold in 1969-1970, and it was revived in 2012 with production ending in 2013. 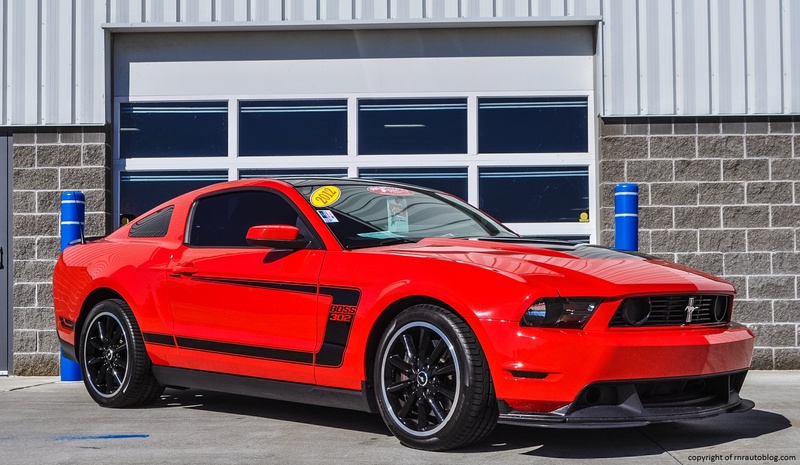 Think of the Boss 302 as a Mustang 5.0 liter V8 GT with mechanical and visual tweaks. 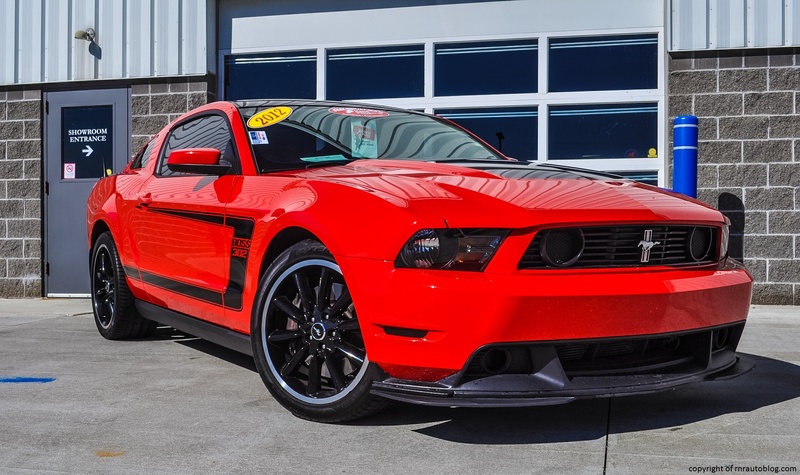 If you want to go for a more extreme version, there was a Boss 302 Laguna Seca edition available. It featured more extreme suspension tweaks, the deletion of the rear seats for a brace to enhance structural rigidity, and it came in four colors with a red roof and red accents. With that said, as soon as the opportunity to review a Boss presented itself, I just knew I had to do it. 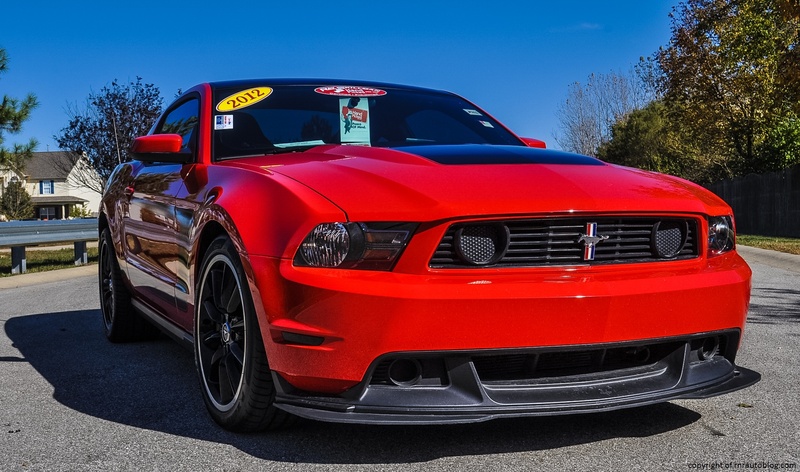 The fifth generation Mustang is not bad on the eyes, and the Boss 302 edition only improves on that front. As if the regular Mustang was not aggressive enough, this edition comes with blacked out wheels, fog lights (in the grille), roof and spoiler. A lowered ride height also contributes to a more menacing demeanor. This is the kind of car that when you just look at it, you just think, “It looks awesome.” It really does. 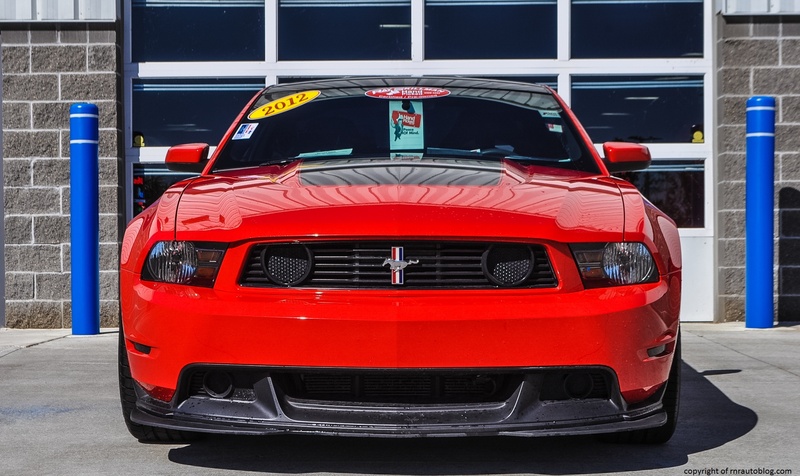 The front features a splitter at the bumper (a Boss 302 feature) which should detract from the appearance, but it actually accentuates the look. The blacked out fog lights in both the bumper and the grille also gives it that no-nonsense look. The hood bump signifies the monster of an engine that lurks underneath. To sum up, the Mustang’s face is nicely toned while not appearing overly brash. 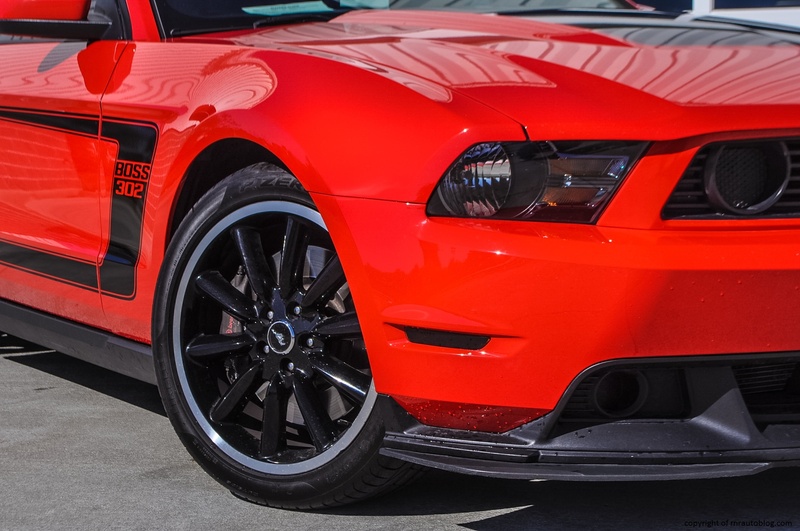 If I had to criticize, the headlights could be darkened or tinted to complete the effect of the Boss 302 edition. 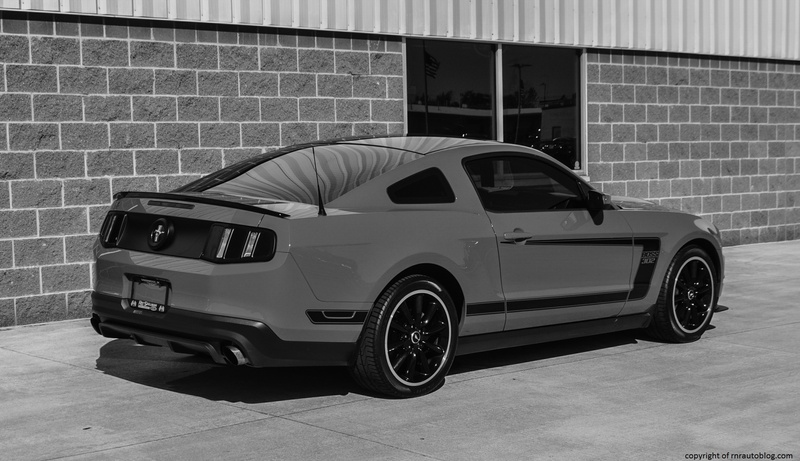 The side profile is what you expect of a Mustang: taut, sleek, and athletic. One nice Boss detail is the “hockey stick” stripes. 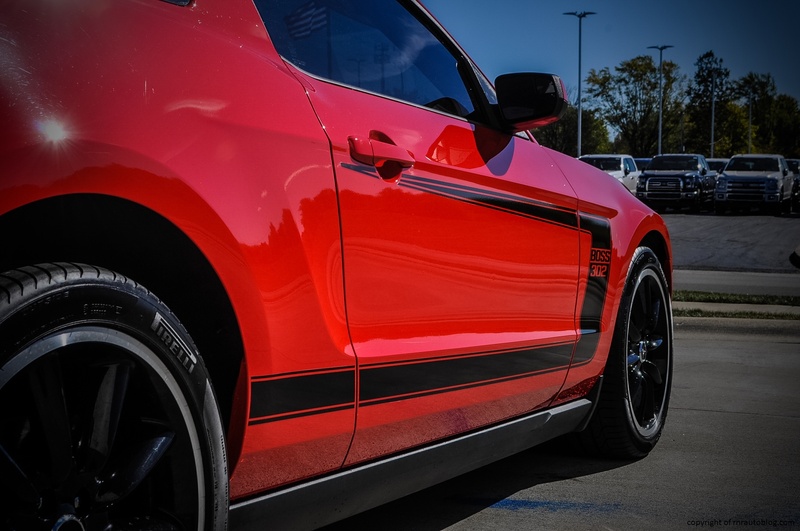 I don’t usually like stripes on the side of a car, but I have to admit; on the Boss, they look fantastic. 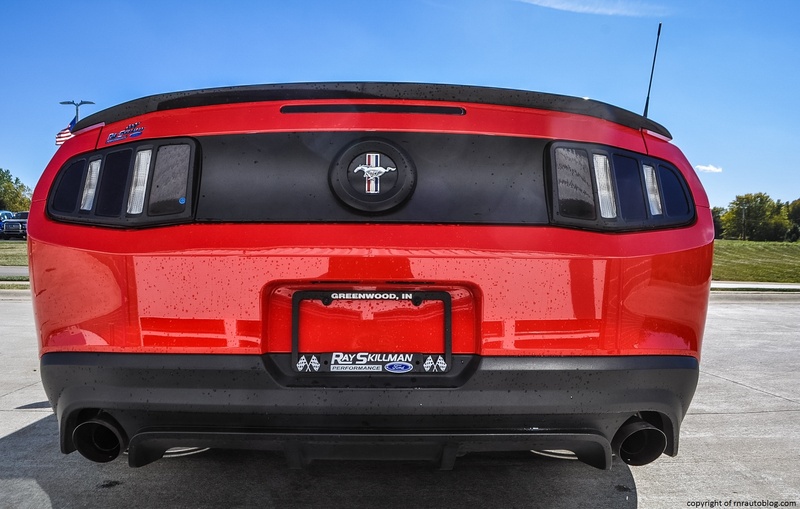 The rear differs from the regular Mustang in that the space between the taillights is matte black (or maybe that is an option for the regular Mustang. I am not entirely sure), and it also features a more aggressive rear valance (on the rear bumper). The taillights (tinted by the previous owner) blend in nicely with the aforementioned space. 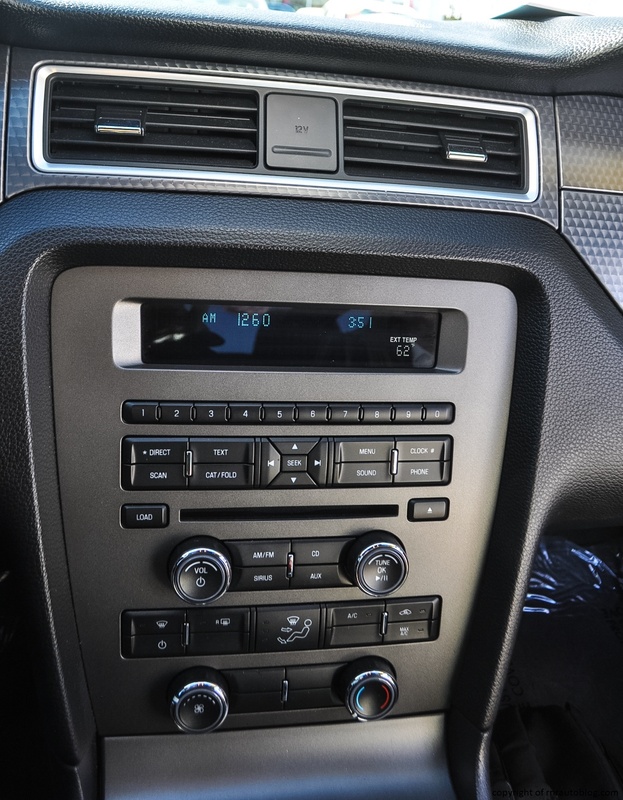 While the interior is not as extreme as the exterior, it is purely function with some nice touches here and there. Inside and out, the Mustang is a looker. 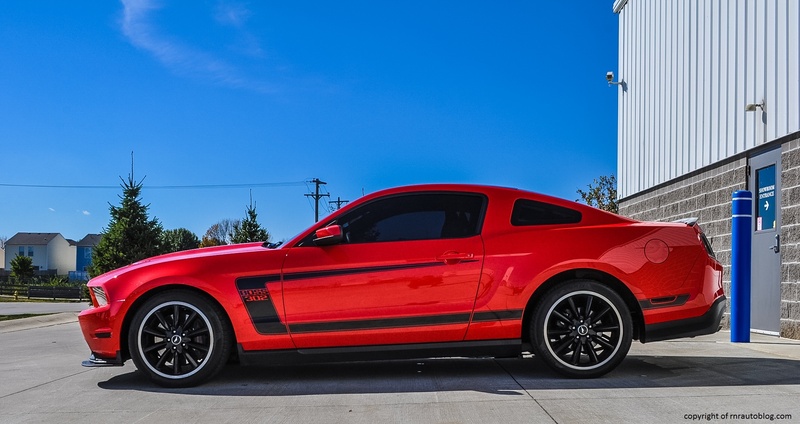 When you are on the move, the Boss 302 feels like any other Mustang which is no bad thing. The steering is well weighted, although it does seem a tad heavier than other Mustangs I have driven. You feel connected to the road through the steering wheel, and it is very responsive. It corners aptly with scant body lean, and it turns in quite nimbly for its size. 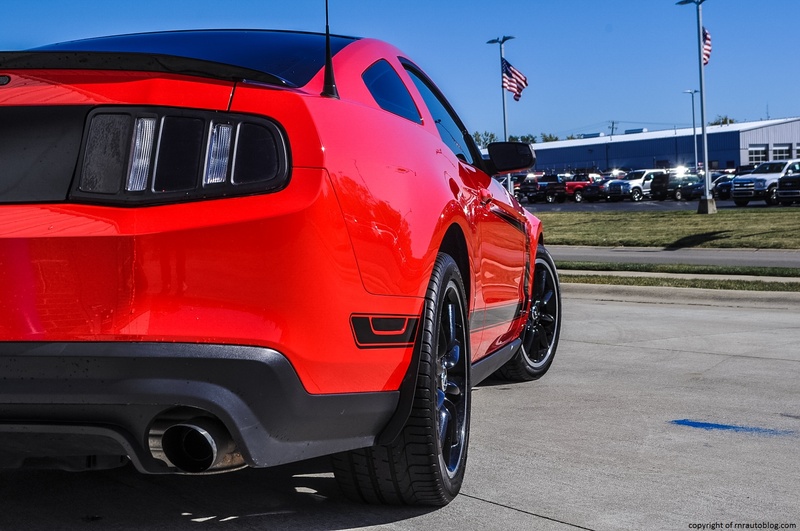 See, the main reason that the Mustang sometimes loses credibility when it comes to sports car prestige is due to the fact that this generation utilizes a rear axle. In short, it basically has the same rear suspension as a truck or truck based SUV. While this means the Mustang displays truck-like rigidity, it also means that sometimes it can feel ponderous in spirited driving. However, that is not the case with this Mustang. 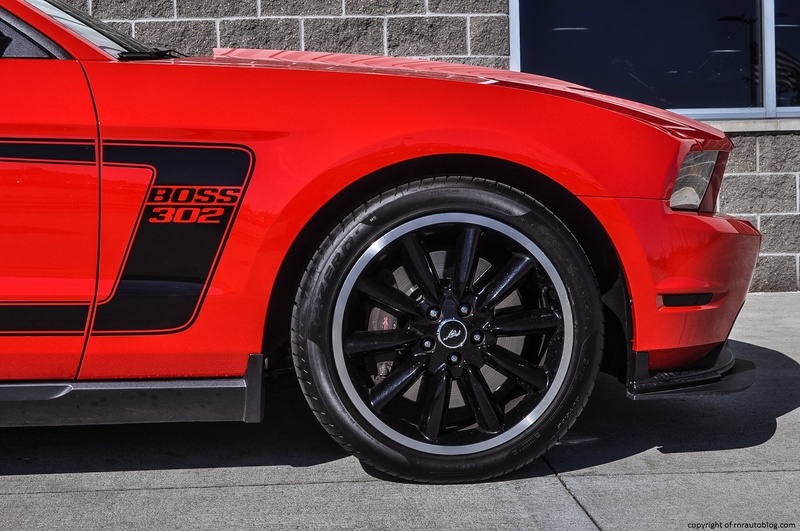 Boss 302 upgrades include a stiffened suspension and other suspension modifications. 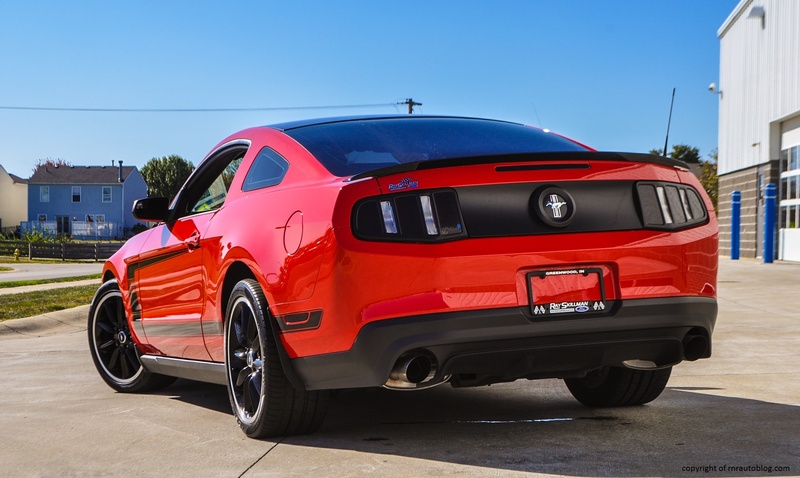 These modifications contribute to the Mustang’s agile feeling. Unfortunately the suspension upgrades do make for a stiff ride. By stiff, I mean stiff as in you feel everything on the road. However, you only notice the road imperfections at low speeds or on noticeably bad roads. Most of the time, you likely won’t be bothered by the ride. The engine is the real party piece. It churns out 444 horsepower, 24 more horsepower more than the standard GT (the 5.0 liter V8 models are referred to as GT models). I say this about any powerful V8, therefore undermining my credibility, but I kid you not: the V8 is just fabulous. Bountiful amounts of torque is available from very low rpms, and it hits its stride right from idle. It keeps charging up the mountain, and it never shows any sign of struggling. 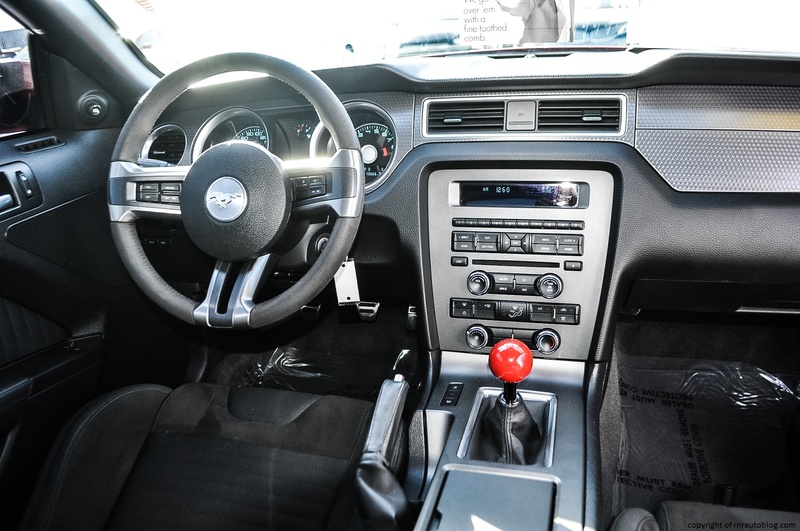 The shifter is classic Mustang, it always has that slight notchiness to remind you of the mechanical linkage that lurks underneath, but it always shifts smoothly. The transmission feels well suited to the engine with balanced ratios either for the track or for daily driving. However, the clutch is stiff and takes some time getting used to. 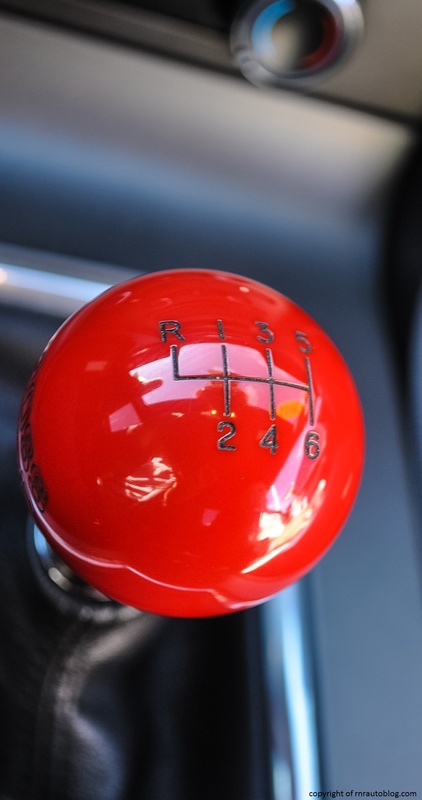 I had no idea of this phenomenon, but apparently some cars with manual transmission today have this feature where if you’re in first gear or reverse, the car will accelerate on its own. Without you even depressing the clutch or the gas pedal! I was very shocked, but apparently this is a thing. I have not been able to find anything on this online, so I don’t really know. But anyways, the aside from that disconcerting feature (which you’ll get used to I imagine), it is a bit stiff, but it conveys decent feel, and you get used to it over time. Remember how I said the engine of this car is the party piece? In terms of power, yes, but also just because of the way it sounds. It sounds marvelous. When you turn on the engine, you are waking up the beast. A snarl emanates and fills up the cabin, and the engine emits a grumbly tone at idle. At speed, the stiff suspension make some poor surfaces audible, but for the most part, it is tolerable for such a sporting car. The engine is louder than usual while cruising, but it settles into the background. Open it up, and the engine lets out a bellow that becomes addictive. I kid you not but it is really hard not to giggle when flooring it. It is just that thunderous. As for the interior, fit and finish is pretty standard. It is not plush, but everything feels substantial and well assembled. The seats are very comfortable, and you snuggle into them easily. With that said, the Recaro seats may not be for everyone’s stature due to their confining design. Access is a bit hard due to the low roof and high door sill so you have to duck before getting in the car. As is typical of coupes, there is no headroom in the back with middling legroom. One detail that I like about the Boss interior is the suede steering wheel. As with other Mustangs, the gauges and controls are easy to master at first glance. Visibility is not the best, but when driving a Boss 302, how can you complain? If anything, the side windows help somewhat. In contrast to the rear, the front feels roomy with loads of legroom and decent headroom. It is easy to find a comfortable driving position, and the gear shifter is nicely located within your reach. 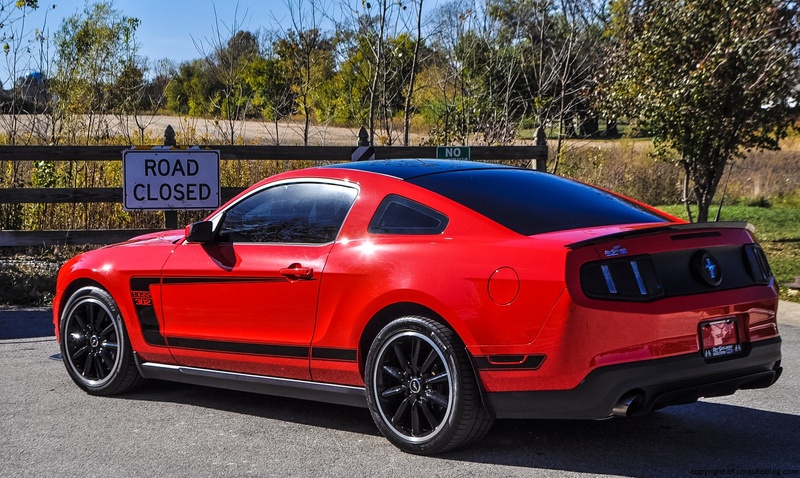 As I mentioned earlier, the 2014 Mustang GT was my favorite out of the Mustangs that I have reviewed, but that title belongs to the Boss 302. I like to think of the Boss 302 as America summed up in a car. It has the brash engine and that no-holds-barred attitude. Mustangs have never felt fragile, not even when you trash it. Hit a nasty bump, and I guarantee the Mustang will be unfazed. 444 horsepower is a lot of horsepower to handle, but the beauty of the Mustang is that even though it is unbelievably fast, it is still livable day to day. It really is the working man’s sports car. This is the car that your little children call the “cool car.” And for all you know, you could be a superhero driving this car. You certainly feel like one driving it. 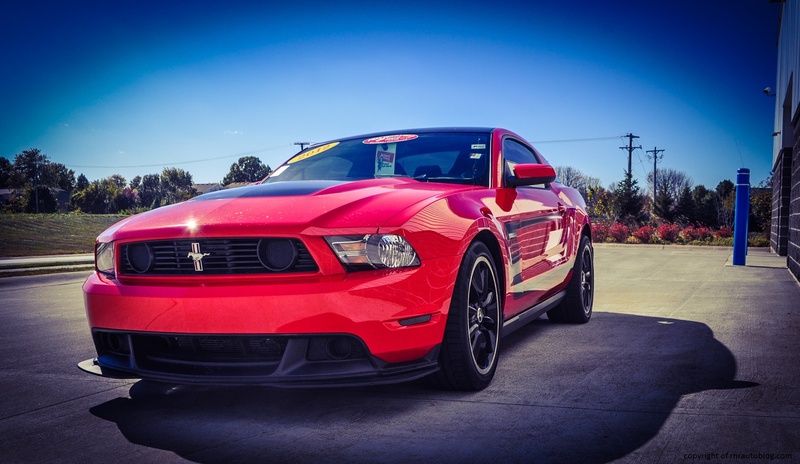 In more rational terms, the Mustang Boss 302 is comfortable, fun, good-looking, and memorable. The fact that it is a Boss 302 makes it such a novelty. 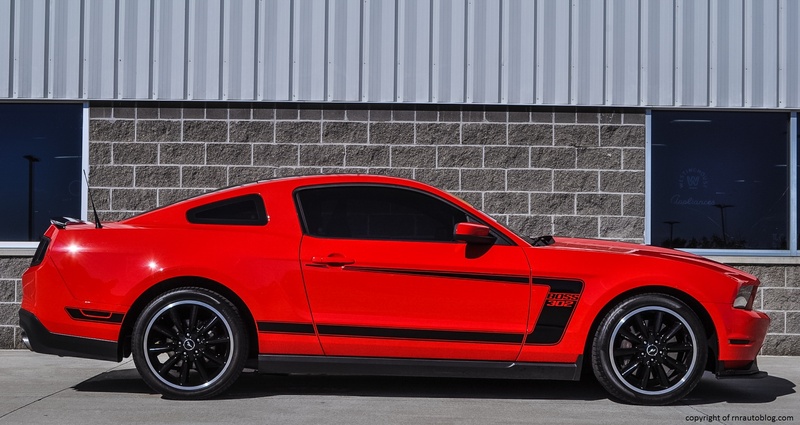 If I had to get a Mustang, I think it would have to be a Boss 302. Or a Bullitt. But I haven’t driven one yet, so a Boss 302 will settle for now. I would like to thank Ray Skillman Ford for allowing me to review this vehicle. 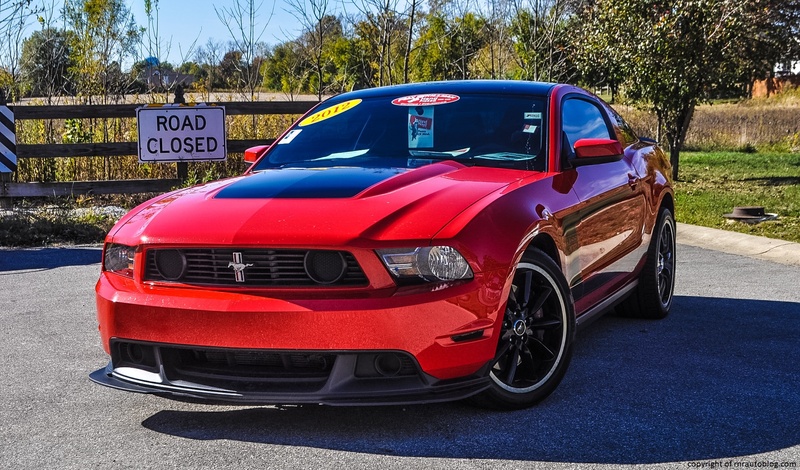 Check out their inventory of Roush Mustangs or other vehicles! I also want to thank personally Deedee Niederhouse-Mandrell for going out of her way to get me this opportunity. She is an amazing photographer as well, so check out her website! I also want to thank the general manager, Dave Everest for making this opportunity possible.